MUMBAI:. Approach Entertainment India’s leading Celebrity, Artists & Talent Management agency has recently added Kiran Sachdev in their Talent Management Portfolio to kick upstairs the Winner of “ Airtel Desh ki Awaaz” (a singing reality show) in the Entertainment Industry. Kiran Sachdev has a perfect voice with right mixture of emotions and expression in her singing. Approach Entertainment will be representing Kiran Sachdev for the Corporate & Social Events, Concerts and Live shows while the main focus will be on Playback Singing for Films in Bollywood. Kiran Sachdev has also performed internationally in Germany, UK and other countries. Approach Entertainment, India’s leading Celebrity, Artists and Talent Management Agency will officially handle the portfolio of Kiran Sachdev to upgrade it and elevate in the Bollywood Film Industry. Kiran Sachdev is the Winner of Singing Reality Show named “Airtel Desh ki Awaaz” in 2008, Approach Entertainment will be responsible to endorse her in the Bollywood Industry for Playback Singing, along with representing her for performances in Live Concerts and Events, Brand Endorsement etc. She has sung for south Indian films as well apart from Bollywood mainstream Hindi films. Kiran Sachdev born in a Punjabi Family is a Singer by profession and currently performing on various International Venues like Germany, London etc. She was introduced to music & singing at the age of 6 by her father Mr. Vikram Sachdev a Mumbai Resident working for Indian & Western Railway. Kiran has been learning Classical Music from her childhood and pursued in London College of Trinity for the Western Classic Music. 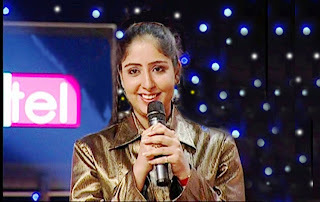 She has won the title of ‘Airtel Desh Ki Awaaz’ in 2008 and also secured the position in the ‘Sa Re Ga Ma’ Finalist. As a perfect blend of sulkiness with Indian Voice with just the right expression of any emotion she has also been nominated in the GIMA (Global Indian Music Awards) in the Category of Non Film Music alongside legends like Lata Ji and Jagjit Singh Ji. Talking about the talent of Kiran Sachdev, Mr. Vikram Sachdev, Kiran’s father says, “Kiran since her childhood has been interested in Music & Singing. This made her win various awards when she was in School and College.” Kiran Sachdev has also given her voice to Balaji Telefilms, Tiger Style UK, Times of India and performed on various Music Shows on different Channels added Mr. Vikram Sachdev. Talking about the sign up, Sonu Tyagi, CEO Approach Entertainment says “Kiran just has the perfect voice and expression combination as a God gift to her and we will be using this quality to promote and build up her profile in the Entertainment Sector and Bollywood Industry”. Adding on this he said, “Kiran has performed on different international platforms and also done various TV Shows like Gazal Sara, Antakshari, Kya Masti Kya Dhoom etc. Therefore it will give us a positive base to endorse her in the Industry and upgrading her portfolio”. Approach Entertainment is India’s leading and Award winning Celebrity Management and Entertainment Company set up in 2004 with its Head Office in Mumbai and branch offices in New Delhi, Gurgaon and Chandigarh. Approach Entertainment is having specialized units in Celebrity and Talent Management, Films Productions, Advertising and Corporate Films Productions, Films Marketing, Events and Integrated Entertainment services. The fast growing entertainment company also bagged “ The Bizz India 2010 Award” in Entrepreneurial category given by World Confederation of Business. The company is part of Integrated PR and Marketing Communications group Approach Communications which is having divisions in PR and Corporate Communications, Entertainment, Digital, Rural Marketing and Business Events. Celebrity Management Division of the agency is handling management affairs for Bollywood Stars, Singers, Artists and Celebrities.